Topic: High and low tides are the result of the earth rotation and of the whirlpools. The current, which moves along the coast, reflects a tidal wave both towards the coast and towards the open sea. The vortex theory of tides can be easily verified by the connection between the height of the tidal wave and the rotation speed of the whirlpools. Irish Sea, North Sea, Barents Sea, Baffin Sea, White Sea, Bering Sea, Sea of ​​Okhotsk, Arabian Sea, Sargasso Sea, Hudson Bay, Maine Bay, Gulf of Alaska. etc. Note: The height of the tidal wave (soliton) and the amplitude of the tides is not the same. Tides are not formed along the entire coast of the seas and oceans, but are formed only on those coasts with a high speed of currents (1-5 km / h). On those coasts where currents do not have a high velocity, tides do not form. With increasing current speed in the north of the Sea of Okhotsk (10 km / h), the height of tides in the Penzhinskaya Bay increases to 12 meters. With increasing current speed in the north of the Gulf of Maine (15 km / h), the height of the tides in the Bay of Fundy rises to 18 meters. "Record high tide in the Bay of Fundy - 21.6 meters - occurred only once in the history of observations, on the night of October 4 to October 5 in 1869 under the influence of the cyclone Saxby Gale." 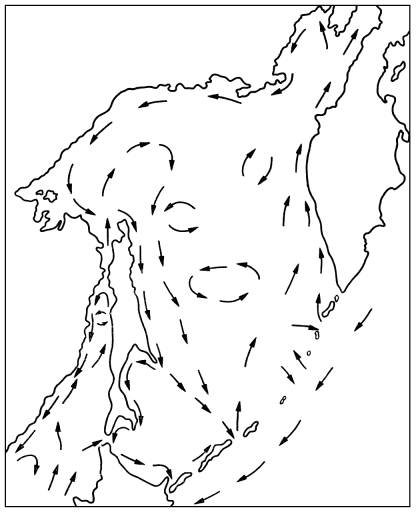 On the night of October 4 to 5, in 1869, under the influence of the cyclone Saxby Gale, "a record rainfall fell over the river basins flowing into the Bay of Fundy (300 mm in one day), so that the waters of the Bay of Fundy poured into the Gulf of Maine and increased the speed of rotation a whirlpool in the Gulf of Maine. In an abnormally cold winter and during a drought, when the rivers flowing into the Bay of Fundy merge, the height of the tides does not exceed 5 meters. Table: The dependence of the amplitude of the tides of the Bay of Fundy, on the flow velocity in the north of the Gulf of Maine. The average speed of the current in the English Channel is: 15-18.5 km / h at Cape Ag France. The maximum height of the tides is 15 m (the city of Saint-Malo, France). The lunar tidal wave, moving from the Indian Ocean from east to west, cuts into the eastern shore of the island of Madagascar, contrary to expectations, creates zero tides. And the abnormally high tides, which for some reason formed in the west of the island of Madagascar. Wikipedia explains this discrepancy by reflection of waves and by the fact that the Coriolis force is performing its work. And the real cause of this inconsistency is the giant whirlpool that revolves around the island of Madagascar at a speed of 9 km / h, precessing the reflective tidal wave to the east coast of Africa. 1. It is believed that the cause of the second lunar tidal hump is the barycenter. And what is the reason for the second solar tidal hump? 2. Who is the author of the theory of tidal resonance and why this theory is not available on the Internet? 3. In the Atlantic Ocean from east to west, to the Gulf of Maine, a tidal current or tidal wave moves and at what speed. The statement that the Earth rotates inside the liquid shell of the ocean, I believe unreal. 4. How to explain the fact that in southwest Australia in the port of Fremantle the tides are part of the year significant, and then disappear. 5. 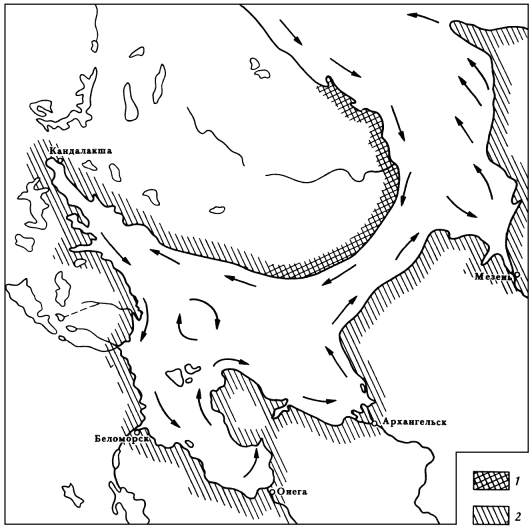 October 3, 1869, the amplitude of the tide in the Bay of Fundy was 5 meters. Question. What happened in the Bay of Fundy in one day (gravity, coastline or the inclination of the lunar orbit have changed). 6. Why abnormally high tides are formed only on the northern and southern shores of the seas and oceans and not on the eastern. 7. Why are tidal waves moving strictly along the perimeter of lakes, seas and oceans, and not from east to west, following the Moon? 8. As the current of the western winds manages to move from west to east, at a speed of 5 km / h, wiping the ocean floor, while the tidal wave flows from east to west at a speed of 800 km / h, wiping the ocean floor. 9. Why is not tidal current used to move ships from east to west. 10. On what theory was the Chinese calendar of the tides of 1100 formed. 11. As long as the tidal wave makes one revolution around the Earth, the Moon makes two turns, how is the gravitational connection between the Moon and the tidal hump? 12. In order that there was a "Moon tidal hump," the heterogeneity of the gravitational field is necessary, and for this, the Moon must constantly be above the hump, otherwise the hump will collapse. 13. The synchronous connection between the moon and the hump is the same as between the hump and the lamp post (next to your house). Tidal waves are synchronized with the Earth's daily rotation, a 50-minute delay, according to the vortex theory of tides. The delay time of the tide (25 minutes) can also depend on the speed of the tidal wave and the distance from the whirlpool to the shore. https://en.m.wikipedia.org/wiki/Lunitidal_interval shows the wave lag behind the moon. https://en.m.wikipedia.org/wiki/Tide_clock shows the daily backlog of the wave. 14. The way to refute the whirlpool theory is to show coves and bays where there are fast rotating whirlpools, but there are no abnormally high tides. 15. Why high tides are formed in temperate zones, and not at the equator? 16. Along the equatorial zone, "tidal force" is everywhere the same, and there is no need to calculate it. this is the point in the ocean where the amplitude of the tidal wave is zero, the tidal wave "runs around" this point around the clockwise or counter-clockwise direction. The lunar theory of tides is too complex, it can not be studied, I think there is no person on earth who knows this theory. Before accepting or refuting the theory, it must be examined. Anyone who understands this theory, he will refuse it. 500 years ago, when the idea of ​​ebbs and flows was formed, thinkers did not have enough technical means to test this idea about whirlpools and gyros, nothing was known. And today this idea, with its simplicity and believability, is so ingrained in the minds of the public and thinkers that it will not be easy to abandon it. The calendar of ebbs and flows existed long before the discovery of a tidal wave, compiled by the “spear method,” as they are now. As there was an ordinary calendar before Ptolemy and after Ptolemy, and before Copernicus, and after Copernicus. On which theory relied on the Chinese calendar of the tides of 1100 ..
Galileo called the Moon theory about tides, a frivolous, sad return to the area of ​​mystical nonsense and preferred to explain tides by the rotation of the Earth. D.G. Darwin wrote in 1911: “There is no need to search for ancient literature for the sake of the grotesque theories of tides”. However, seafarers manage to measure their height and take advantage of the tides, having no idea about the real causes of their occurrence ..
are you trying to say that the moon does not cause tides? then how come tide charts based on the moon are so accurate? The calendar of tides is based on observations of long-term data. It existed before the discovery of the theory of tides. Where the rotation speed of the whirlpools the constant height of the tides does not change, the rotation speed of the whirlpools usually changes in the bays. Always wondered where does all that water go when the tides out Can't go that far can it as it's all back in just a few hours but then the same amount never comes back the next day, so who took it? Then show us your simple maths to accurately calculate the tides at a given place using whirlpools please. I'd gladly give up using harmonics if there was a much simpler way of doing it. To calculate the height of the tides, you need to know the rotation speed of the whirlpools and the depth of the sea. To calculate the height of the tides of the Bay of Fundy, you need to know the speed of flow in the north of the Gulf of Maine, but this data is not. 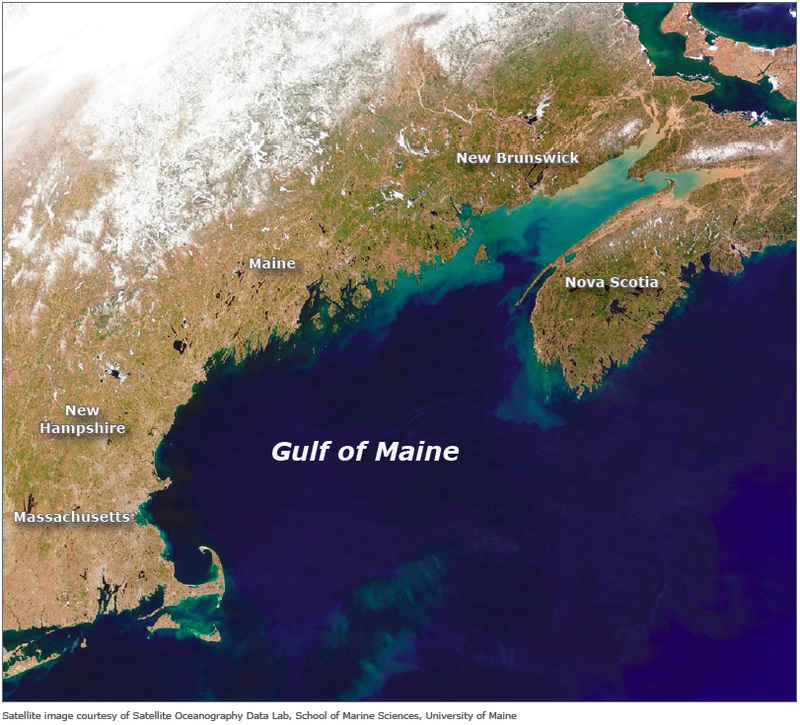 In the Bay of Fundy, for the formation of tides 18 meters high, the flow in the north of the Gulf of Maine should be about 15 km / h.
To calculate the height of the tides in the Bay of Fundy, you need to know the speed of the whirlpool and the depth of the Gulf of Maine. If anyone has this information, please write them. So what is the purpose to all of this whirlpool theory? It is believed that the maximum tides are formed in the new moon and the minimum tides are formed in a quadrature. Has anyone tested this? (Minimal tides are formed in a full moon)? Yes, very easily observed at places with large tidal ranges, we have about 5-6m range, springs and neaps are obvious. Fluctuation of the amplitude of tides during the month is a rather complex phenomenon of nature and it will be rather difficult to explain it without a model of the solar system. This is due to the oscillation of the orbital velocity of the earth, and the complex trajectory of the earth's motion in orbit, because of the barycenter. The center of the earth can be imagined as a material point that moves in orbit at a speed of about 30 km / s, while the Bay of Fundy revolving around this point at a speed of 1,700 km / h, moves relative to the sun, then forward and backward, then tops downwards, which adds additional complexity. This link shows that the height of the tides in the Gulf of Saint-Malo can determine the speed of the current in the Bay of La Mancha. This month, the average height of the tides is about 10 meters and the speed of the current should be about 10 km / h.
If these numbers do not coincide, then the whirlpool theory can be considered a mistake. Aren't you confusing cause and effect? Sharp fluctuations in the amplitude of tides occur not only in the Bay of Fundy, but also in other bays where rivers flow. Re: High and low tides are the result of the earth rotation and of the whirlpools. On the German coast of the North Sea, the height of the tides depends on the speed of the current along the coast. When the current moves at a speed of 1 km / h, the height of the tides will be one meter. In order to disprove the whirlpool theory of tides, it is necessary to disprove this table, which is almost impossible. Table of the dependence of the height of the tidal wave, on the speed of currents along all coasts of Germany and the world.